Portsmouth is aglow with holiday lights, decorations and cheer—and lots of ways to celebrate the season. Whether you favor the chill in the air or a warm interior, there’s something in store for everyone. Here are a few things to enjoy in the port city this week. Comprised of a group of men and women who can sing in perfect harmony, Con Tutti will be holding their inspiring seasonal concert this week. They’re performing on December 8 at 7:30 p.m. at the South Church. The name of their winter concert is “Here We Come A-Wassailing.” Don’t miss it! Part of the Strawberry Banke Museum, Labrie Family Skate at Puddle Dock Pond opened this week and is ready for fun on the ice. 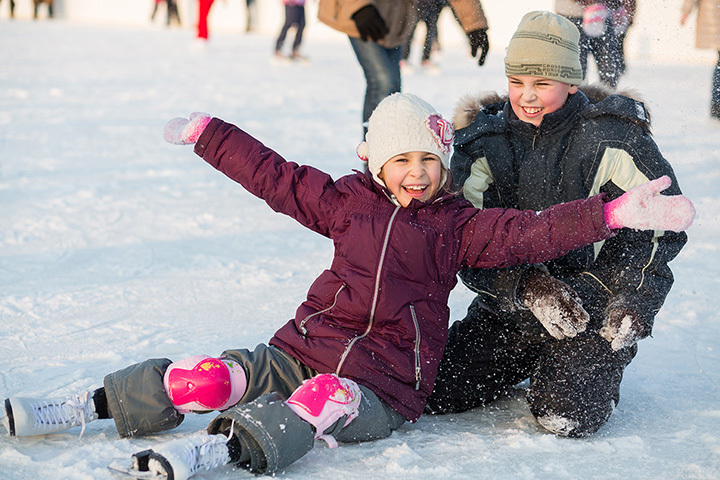 Skate rentals are available, and tickets may be purchased individually or in books of 10. A viewing area is available just outside the rink and a café for coffee, hot chocolate and more is open during most skating hours. Boutiques, hair salons, gift shops, and more all over Portsmouth are taking part in Tote Around Town 3.0. Shoppers will enjoy every business involved and will receive a custom tote bag after spending just $20. For each additional $20 spent, stamps are earned and may be redeemed for entries into a raffle. Some of the businesses will serve warm beverages and holiday goodies. Others will feature live music along with special promotions. Supporting local businesses is a great way to get into the holiday spirit—while checking names off your holiday shopping list. So far, approximately 60 businesses have signed on. Visit the Facebook page for a list of participants. Discover Portsmouth’s Gingerbread Exhibit is open to the public from 9:30 a.m. to 8 p.m. on Friday, December 7. Check out the many gingerbread houses on display and vote for your favorite. You’ll see some real art, with gingerbread as the medium of choice. Winners will be announced on December 22. Straight from Portsmouth City Hall: Affordable Parking for Elf! If you’re going to see Elf at the Music Hall in Portsmouth, the city is giving you a deal on parking. Simply park in the new Foundry Place Garage—just two and a half blocks away—and pay just $3 to park. Bring your parking ticket with you to the Music Hall, and the maitre d’ will give you a validation sticker at the end of the performance. Since parking in Portsmouth is a huge deterrent, this is definitely a big deal!